Osteopenia and vitamin D deficiency are known to be associated with hyperthyroidism. 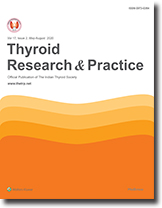 Some studies suggest that serum 25-hydroxy vitamin D may be monitored in patients with Graves' disease during antithyroid drug therapy and vitamin D and calcium supplementation are recommended for patients with vitamin D deficiency. Few studies have suggested that prophylaxis for osteoporosis is appropriate for patients who have hyperthyroid disorder with assessment of bone mineral density and perhaps pharmacological therapy for those with additional risk factors. But there is still no consensus about screening of Graves' patients for vitamin D deficiency/osteopenia and it's prophylaxis and treatment. This is a preliminary study to evaluate bone health in patients of hyperthyroid Graves' disease. We measured the bone mineral density in 14 patients of Graves' disease and compared it to normal age and sexmatched controls. The bone mineral density was found to be significantly low at forearm and spine compared to normal healthy population. Differentiated Thyroid Cancer (DTC) is usually not very common (incidence is about 1 % of all cancers; women are more often affected than men). However, higher incidence has been reported in many parts of South East Asia particularly in iodine deficient areas. Unlike other solid tumors, DTC is potentially curable with documented survival rate of > 90 %. Even if the disease is not totally cured, through repeated high dose radioiodine therapy the progress of the disease can be controlled with significant improvement in quality of life for many years. This is possible if a proper and state of the art therapeutic approach is made. Since the incidence is relatively low, individual experience of treating physicians or centers is mostly inadequate leading to improper management with subsequent increase in morbidity and mortality. The purpose of this review is to evolve a rational management protocol for the treatment of thyroid cancer. Centers which do not have all facilities like high dose radioiodine (RI) therapy etc. may still follow the protocol by referring the patient for a particular step to another centre. What is needed is the awareness of the treating physician about the appropriate management of DTC. In recent past there has been some important developments in the management of differentiated thyroid cancer like use of recombinant human thyrotropin (rhTSH ), use of retinoic acid for redifferentiation etc. Some of these developments having practical relevance have been briefly mentioned. Teriparatide (parathyroid hormone N 1-34 fragment) is a novel anabolic therapy for the management of osteoporosis. This case report describes the rapid onset of action of teriparatide in improving bone mineral density in a 48 year old lady with thyrotoxicosis and osteoporosis who had not responded to alendronate and tibolone. The etiologic factors for osteoporosis were postmenopausal state and iatrogenic thyrotoxicosis due to administration of high doses of L-thyroxine over 10 years. Recurrance of subacute thyroiditis is rare. Here we report a case of antibody negative subacute painless thyroiditis who is having recurrent thyrotoxicosis.